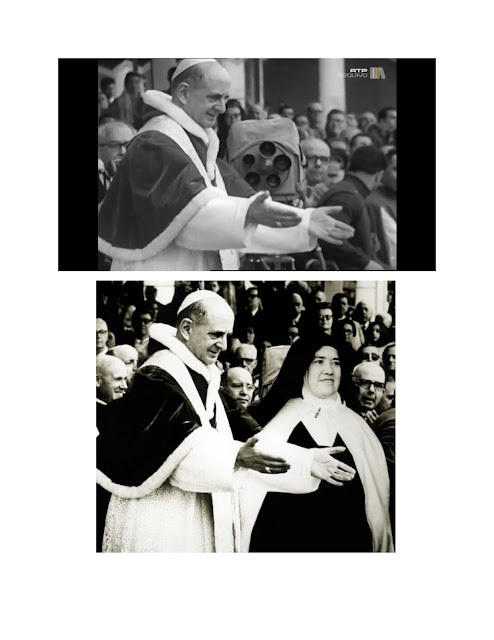 Faked Photo of Paul VI and Sister Lucy Published In Official Sources. Why Fake a Photo of an Event that "Actually Happened"? 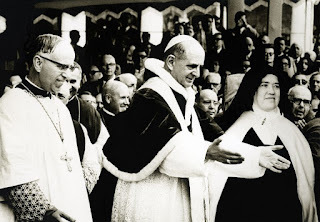 Original Photo of "the Meeting" between Paul VI and "Sister Lucy" found! TV Camera Stands Next to Paul VI. "Sister Lucy" Cut and Pasted In. Dr. Chojnowski: Due to the diligent work of a co-worker in the Sister Lucy Truth project, we have come up with the original picture of the first appearance of Sister Lucy II. As you can see by examining the two pictures, the TV camera still appears in the background of the superimposed "Sister Lucy". This was the faked picture that the plastic surgeon immediately recognized was "photoshopped." Sister Lucy II's face is slightly turned from the source photo, so as to make the eyes point in the proper direction. One of the strange things that can be noticed about Paul VI's arm is that in the faked picture, the fingers of his right hand are much farther away from his left sleeve than they are in the original photo. When you look at Sister Lucy II in this photo for a while the faked nature of the photo becomes perfectly clear. Best Video footage of the first time the Imposter Sister Lucy was put before the Public on May 13, 1967 and, also, Close-Up Footage of the Imposter Aged 70 or 80. One interesting thing about this picture is that when the Plastic Surgeon was presented with all the file of pictures of Sister Lucy, he, without any prompting from us said, "This picture has been photoshopped." His analysis of this will be included in the report that will be issued. Paul VI Meeting with "Sister Lucy" in Fatima on May 13, 1967. Here the deception is unrecognized by hundreds of thousands. Here is the best close up video of the laughing, light-hearted, joking "Sister Lucy" who replaced the Real Sister Lucy, one of the "prophets of doom." Plastic Surgeon, Ophthalmologist, and Cosmetic Dentist's Reports to be Added to Sister Lucy Truth Report. 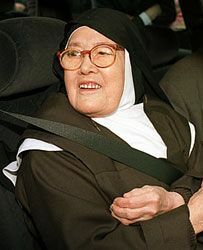 No Aspect of Sister Lucy Case to be Neglected. Please Help. UPDATE: PLASTIC SURGEON'S ANALYSIS IS COMPLETE. REPORT TO BE ISSUED. In order to ensure that no aspect of the Sister Lucy Mystery escapes our attention and our analysis, Sister Lucy Truth has hired top-flight experts in their respective fields to analyze various aspects of the Two Sister Lucy Case. 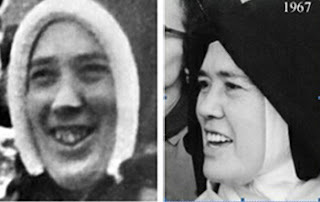 A plastic surgeon, ophthalmologist, and a cosmetic dentist have been given a file of pictures from Sister Lucy I and Sister Lucy II to analyze, from a professional standpoint, the apparent inconsistencies between the physical traits revealed in the photos of the pre and post-1958 Sister Lucy. These expert reports will be both submitted to the Investigator and included as part of the file that shall be released to the public. 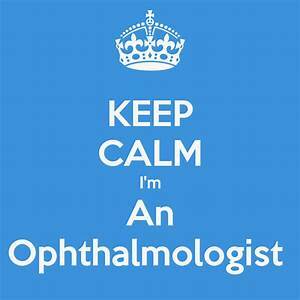 We are hoping to get ALL of the expert analysis done THIS WEEKEND. We have also now have the active support of an attorney who as been researching the Sister Lucy Case for a number of years. Is this Why they Needed to Get Rid of Sister Lucy and Substitute an Impostor? I wonder what "False Church" Padre Pio was speaking about in 1960? Can't Imagine. Prior to his death in 2016, Fr. Gabriele Amorth had performed over 70,000 exorcisms over a span of 30 years. He founded the International Association of Exorcists in 1990. Hear the Latest on the Sister Lucy Investigation and Much Else on TradCat Knight Tonight 8:15PM to 9:00PM. Call in Your Questions. Patience! Sister Lucy Truth Investigation Barrels Forward. New Experts Added to Team With New Information. Facial Recognition and Forensic Report Coming Soon.